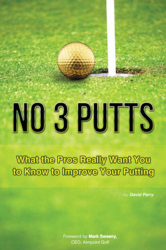 David Perry’s just released book, No 3 Putts: What the Pros Really Want you to Know to Improve Your Putting, is now available at Amazon in print format. The just released book, No 3 Putts, is now available at Amazon. In the book, "No 3 Putts", Perry compiles the putting knowledge, experiences and lessons learned from top rated golf instructors and club fitters. The insights from these professionals can be applied immediately by golfers of all skills levels. The forward to the book is by Mark Sweeney, CEO AimPoint Golf. The book contains real world information, such as how well golfers really aim their putters, which will open the eyes of many golfers to the reality and challenge of the putting experience. This is a must read for golfers of all levels who want to better understand the putting environment and improve their game. For more information, go to http://www.no3puttsbook.com. A free excerpt is available.